A central Minnesota farm has donated tens of thousands of pounds of potatoes to feed those in need for Thanksgiving. CLEAR LAKE, Minn. - On Monday, Edling Farms in Clear Lake donated 36,000 pounds of potatoes to Union Gospel Mission Twin Cities. "There's definitely a need. We're fortunate enough to grow something that can help somebody else out," said Brett Edling, who owns Edling Farms with his two brothers and dad. Edling said for the past six or seven years, they've donated potatoes to Union Gospel Mission Twin Cities. The Christian ministry will use the potatoes as part of its 60,000 Thanksgiving meals to the community. The potatoes are part of meal bags for families of five that include a frozen turkey, vegetables, gravy, dessert and cranberries. They'll also use them during their annual Thanksgiving luncheon meal that is served at the Union Gospel Mission Men's Campus in St. Paul. This will be the 61st year of the Union Gospel Mission Thanksgiving food distribution effort. Rick Berggren of Union Gospel Mission talks to Brett Edling of Edling Farms. "Those 60,000 meals... they'll go to folks that are staying here at the Mission, folks that are low-income... here in the Cities and then folks just across the entire community that need a little extra help this time of year," explained Brian Molohon, vice president of development for Union Gospel Mission Twin Cities. It took two trips to transfer all the potatoes from Clear Lake to St. Paul. Ron Janes, who is now retired but used to own a trucking business, volunteered to transport the potatoes in a semi-truck. It's his third year doing so. When talking about the people who are in need of help, Janes said, "I can't turn my back on them. So I do what I can do." 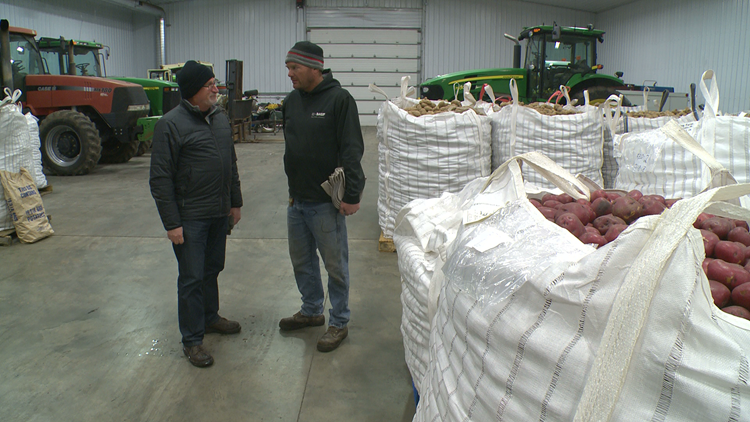 Edling Farms gave 17 totes of potatoes weighing about 2,100 pounds each. Volunteers will now come in and sort through these totes down to 5-pound bags. Those will be part of the food bags given out next week. Union Gospel Mission's Thanksgiving effort takes about 800 volunteers. While Thanksgiving day maxes out on volunteers about two months in advance, Molohon said they are in need of volunteers year-round. You can find out more information on how you can help, here.